Developer and maker Michael Darby has this week unveiled a new wearable device he has created using the awesome Raspberry Pi mini PC. In the form of PiGlass, a wearable environmental monitoring system. using a Raspberry Pi Zero, Enviro pHAT, Google Cardboard Lense, Powerboost 500, Blu-Tack and a number of other components the wearable environmental monitoring system is capable of reading temperature, pressure, light and motion. • Make a device that can measure environmental conditions and relay to the user. 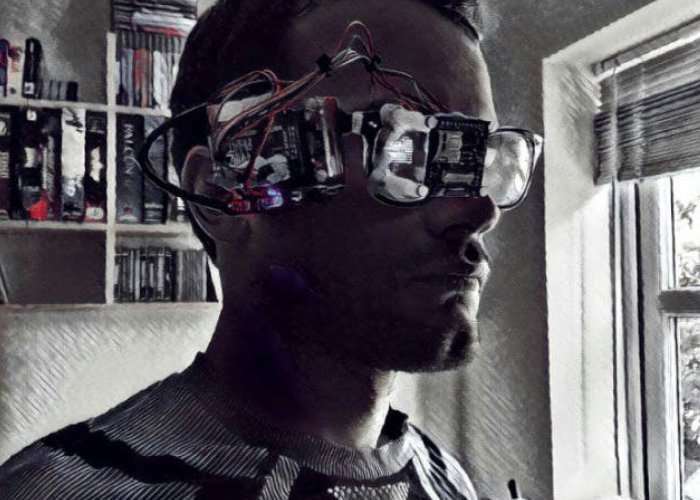 In the interests of producing more wearable tech, I thought; what would be cooler than a Raspberry Pi attached to a pair of glasses that can show sensor data to the wearers eye? So I wanted something wearable – simple enough, I thought; get the usual Powerboost 500, battery, Pi combo all together with some sensors and whack in an OLED screen – after using Google Cardboard I realised I could use the lenses from said to make the screen readable close to the eye. I had a scout around for some sensor kits, some were too big such as this, it would have worked but would have been a bit too bulky and I didn’t need the lighting – after some further searching I discovered the Enviro pHAT. It covers anything a growing nerd could need to monitor, over 4 different sensors: Temp/Pressure/Light/Motion. More details on PiGlass jump over to the hackster.io website via the link below. If you enjoy building Pi projects you might be interested in our comprehensive list of Raspberry Pi displays, HATS and small screens.